From turtles to snakes, reptiles are surprisingly cute and fun to care for. Making sure that your scaly friend has the right food to eat is just as important as watching your own diet. There are an estimated 9,500 different species of reptiles on the face of the planet, from the meat-gobbling crocodile to the lettuce-loving tortoise. There’s no such thing as a “one size fits all” reptile diet. That means it’s important to do your research on your pet. Spend time reading about the wild diet of your reptile’s species, and then find the appropriate mix of fresh food, pellets, and supplements to keep him healthy for a long life. Every species of reptile eats a slightly different diet. Let's take a peek at some of the foods that each group of reptiles generally eats. You'll probably feed your pet snake rodents, since they're by far the easiest way to feed a captive reptile. These may be fed at different ages and can be frozen, freshly killed, or alive. Some snakes won’t eat food unless it’s moving, meaning that there aren’t really any options for avoiding rodents if you’ve got a carnivorous reptile. If you’re squeamish about feeding frozen or live mice to your new pet, consider avoiding carnivorous snakes! Feeding your carnivorous snake can get expensive quickly if you’re not able to raise your own rodents. Examples of pet snakes that eat meat include ball pythons and corn snakes. Lizards are a varied bunch! Most smaller lizards are mostly insectivores. However, other species of lizard can be herbivorous (vegetarian) or omnivorous (both meat and veggies). Some big lizards are true predators, eating larger mammals with ease—but those aren't common as pets. Insectivorous lizards are probably a better choice if you’re comfortable with killing crickets but not rats. The specific diet varies a lot depending on the species of lizard. Most people feed their lizards crickets, mealworms, or waxworms. It’s usually pretty easy to find crickets at your local pet supply store, making it easy to feed these reptiles. That said, if you only feed crickets, your insectivore can develop deficiencies in some nutrients. You may want to explore supplement options. Examples of pet insectivorous lizards include anoles, leopard geckos, and long-tailed skinks. Iguanas, another common pet lizard, are mostly vegetarian. Bearded dragons and blue-tongued skinks are omnivores. What Do Turtles and Tortoises Eat? 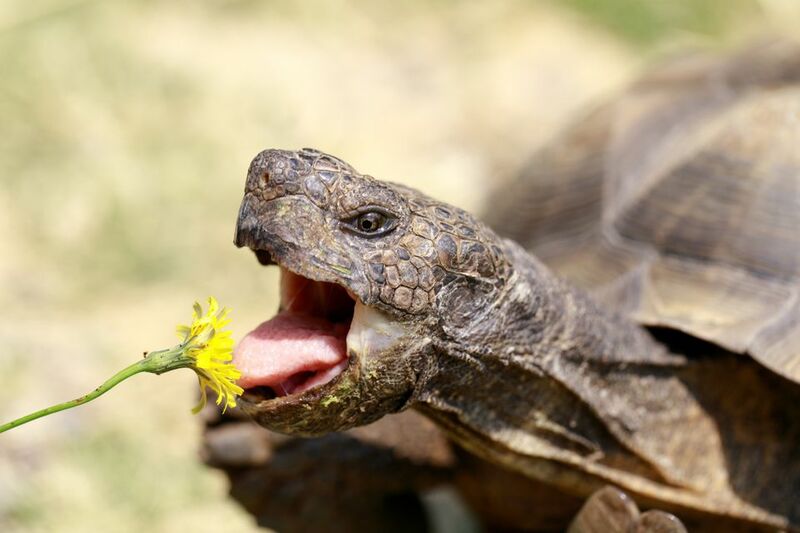 Herbivorous turtles and tortoises might be appealing if you don’t like the idea of other animals dying to feed your pet. Turtles and tortoises often have complex nutritional needs because they evolved to eat such a variety! Many omnivorous reptiles do best with a supplement or pellets to augment their fresh meals. Common examples of pet turtles are the herbivorous Russian tortoise and the omnivorous red-eared slider. Does My Reptile Need Supplements? Most pet reptiles eat much less varied food than they would in the wild. For example, we often just feed crickets to our anoles and mice to our corn snakes. Even what the mice eat when they’re alive is pretty bland, which can reduce their nutritional quality! If the mice always eat nothing but plain old pellets, they’re less nutritious for your snake. Nutritional deficiencies can lead to weak bones, vulnerability to disease, and a generally shorter life for your pet. Pellets are a great way to augment your reptile’s diet, especially for herbivores and omnivores. These balanced diets go a long way to making your reptile more healthy. Even with a mix of pellets and fresh food, many pet reptiles benefit from—or even need—supplements. Which supplements your reptile needs will vary greatly based on what you feed him and what species it is. Some reptile owners feed their crickets and mice a supplemented diet, dust their crickets with supplement powder, or sprinkle supplement powder onto fruits and veggies. You can even add supplements to water for some reptiles! In short, there are a lot of different ways to ensure that your reptile gets the diet it needs. The most important thing is knowing your species and doing your research to provide it with the best diet possible.